The Silver Institute: Despite headwinds that confronted many asset classes in 2018, including most of the commodities complex, three significantly positive developments emerged in the silver market last year. First, total silver demand increased for the first time since 2015, rising 4 percent to 1.03 billion ounces. Second, there was a robust recovery in retail investment, led principally by silver bar demand, which climbed sharply last year. These developments, and many others in the silver market, are discussed in World Silver Survey 2019, released today by the Silver Institute at events in New York City and Dubai, and tomorrow in Mexico City. The Survey is researched and produced by the GFMS Team at Refinitiv (GFMS). The 4 percent growth in total silver demand for 2018, reaching 1.03 billion ounces, marked a three-year high. The silver coin and bar category rose by an impressive 20 percent, although the rise was entirely driven by silver bar demand, which jumped up by 53 percent. Silver bar demand was led by exceptionally strong sentiment in India, where demand leaped 115 percent higher last year. In contrast, coin and medal demand dipped by 4 percent, although the decrease was considerably lower than the losses recorded in 2017. Silver jewelry demand moved 4 percent higher in 2018 to 212.5 Moz. India was again the standout, pushing its demand for jewelry up 16 percent to achieve a new record level. Demand also picked up strongly in North America, with the United States posting a 7 percent rise to an all-time high at 17.4 Moz. Global demand for silverware jumped by 6 percent last year to 61.1 Moz, led by a strong recovery in demand from India, which experienced a 10 percent increase to 41.8 Moz. Turkish silverware demand rose by 20 percent to 1.6 Moz, a level not seen since 2009. Global industrial silver demand contracted 1 percent to 578.6 Moz, primarily due to a dip in silver’s use in photovoltaics (PV), which was down 9 percent last year. The PV sector faced ongoing thrifting and substitution pressures last year. Looking ahead, demand for silver from the PV sector is forecast to improve as governments from various countries continue their commitment to generating electricity from renewable energy sources, including solar. Australia, Europe and India are anticipated to see increased installations of solar energy systems in the coming years. Global silver mine production fell 2 percent in 2018, experiencing its third consecutive annual decline to 855.7 Moz, following supply disruptions in Canada, Guatemala and the United States. For the second year, the biggest year-on-year variation was posted by primary silver mines, which decreased by 7 percent in 2018 to contribute 26 percent of total mine supply. The lead/zinc sector contributed 38 percent of by-product silver output, followed by copper at 23 percent and gold at 12 percent. At the regional level, North America posted the biggest contraction last year, dropping 6 percent. Offsetting those losses was a record output from Mexico, which was once again the world’s top silver producing country, trailed by Peru, China, Russia and Chile. Silver scrap supply fell by 2 percent to 151.3 Moz. Lower silver prices accounted for the bulk of the decline, discouraging suppliers and consumers from recycling their silver valuables. Following 9 consecutive annual increases, identifiable above-ground stocks fell 3 percent last year. North America was the only region to report an increase in above-ground stocks and was up 9 percent, while Europe recorded a 9 percent decline and Asia posted a 14 percent decline. GFMS reports that government sales of silver were once again absent from the silver market in 2018, while the delta-adjusted hedge book declined by 2.8 Moz last year. The annual average silver price fell by 7.8 percent to $15.71/oz last year, with prices trading in a $13.97/oz – $17.52/oz range. A combination of factors, including a rising U.S. dollar, interest rate hikes, the trade dispute between the United States and China, and lower global economic growth projections from the International Monetary Fund, affected the silver price last year. Identifiable investment, which consists of net-physical bar investment, coins and medals purchases, and net-changes to exchange-traded product (ETP) holdings, rose by 5 percent in 2018, reaching 161.0 Moz. This rise was entirely attributed to the upsurge in silver bar purchases. In contrast, total global ETP holdings decreased by 20.3 Moz to finish 2018 at 649.5 Moz. 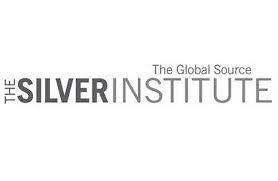 The Silver Institute has published this annual report on the global silver market since 1990, to bring dependable supply and demand statistics to market participants and the public. This 29th edition of the Silver Institute’s World Silver Survey was independently researched and compiled by the GFMS team at Refinitiv. The report was sponsored by 19 companies and organizations from North and South America, Europe and Asia.